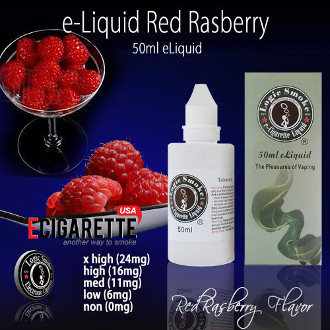 Red Raspberry e liquid flavor has a great true life raspberry flavor that will quickly become your everyday vape. You'll keep coming back for more whether you vape it by itself or add it to any number of other wonderful flavors such as chocolate or green tea. However you choose to vape our Red Raspberry e liquid flavor we know you'll enjoy the experience. With the perfect blend of an 80/20 PG/VG mix (propylene glycol and vegetable glycerin: organic, food grade preservative compounds), you'll get the best e liquid flavor concentration along with the perfect amount of vapor to satisfy your vaping needs.